Weight- Just a touch under 200lbs Sail area: just under 400sq feet Built by VMG Skiffs in Frankfort, MI More Pictures: Of the boat on April 3, 2010- http://www.flickr.com/photos/28547959@N05/sets/72157623764782952/ Class site- http://swiftsolo.com/home.html Designer site- http://www.single-handedskiffs.com/ Hull- The hulls from VMG are amazing quality. Re-painted in December of 2008, and re-varnished in January of 2009. Mast- Full Carbon- Mast, Boom, Spin Pole. Mast (Forte tube) is replaced in 2007 by NYC Skiffs, yes it is white, keep the mast cooler in the sun. Vang was replaced out with a line based system. Boom & Spin Pole is painted white to match the Mast. Sails- Main and Jib are all standard Bank sails. The kite is a Dynakota Bank sail. Any repairs on Kite were done by Banks Sails in Aug 2009. 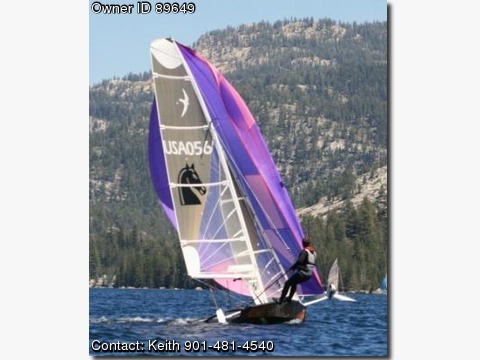 Foils- Both are standard 49er boards. Rudder cassette is full carbon. Rudder is from VMG, Centerboard was replaced in 2006 with a Vanguard 49er board. Tiller extensions are standard aluminum Ronstan tiller extensions with hockey tape. Blocks- All Ronstan or Harken. Standard is Ronstan unless not available. Trailers / Dolly- Custom flat bed trailer with one tool boxes. (includes all the needed tie downs) The Road trailer has over 18,000 miles on it. Mast end cover for travel included. (Trailer stilling running great, just put new tires on it in July 2009) Spare tire included. Dolly- Modified 49er dolly with 4’x4’, full form cradle. Boat cover has 3 years on it and is in ok shape; I had the cover re-sewed in Nov 2009 with extra loops in top. Other/extra Gear- Extra Kite Sock that was replaced in 2008 (stained) Number of extra spare parts (ports covers and custom items) See the Flickr link to just view them… Loos gauge & tape measure, Extra non-skid, spare kite sheet, sail repair tape, extra ports… Extra Ronstan Tiller Extension that ready to go. Paperwork- Boat comes with copy of construction guide and rigging notes.